(HOLLYWOOD) — The Star Wars fans came out in full force Thursday in Los Angeles to see Star Wars icon Mark Hamill receive his star on the Hollywood Walk of Fame. The crowds were so large that they shut down Hollywood Blvd. But Ford later got serious, remembering his and Hamill’s late Star Wars’ co-star, Carrie Fisher, whose daughter Billie Lourd was also in attendance. When it was Hamill’s turn to speak, he was overcome with emotion. “I haven’t been this speechless since Force Awakens!” he said, as the crowd laughed. Hamill famously did not have any lines in that film. 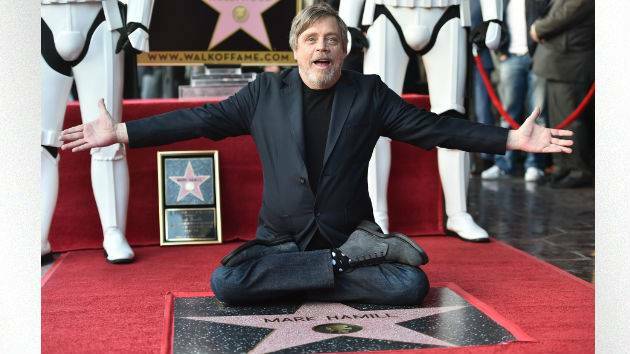 Finally, he thanked the fans for being with him throughout his long career, which has not only included the Star Wars franchise, but various voice-over roles in TV and video games. His most famous of those roles is perhaps the Joker in Batman: The Animated Series. “From Jedi to Joker, it’s been a fantastic ride. Thank you so much and may the Force be with each and every one of you,” he said, signing off with his famous Joker cackle.